While I was neglecting my blogging duties last month, the Supreme Court ruled on the constitutionality of the Affordable Care Act aka ObamaCare. Since then the debate reignited on several points: Did the Supreme Court get it right or wrong by ruling the individual mandate constitutional because it was really a tax? Did Chief Justice John Roberts bravely rule on the constitutional merits of the law or did he hide behind the fig leaf of congressional taxing power? Did he show judicial activism or judicial restraint? Is ObamaCare the biggest tax increase of all time or is it not? Will ObamaCare reduce the deficit or take the deficit to new heights? Some of these questions answer themselves. If ObamaCare costs $1 trillion dollars to provide new benefits (and it does), and it does not really control costs (it doesn't), and it really is deficit neutral (as the CBO asserts), then simple arithmetic tells us it must also raise $1 trillion dollars of new revenue (which SCOTUS identifies as a tax to be constitutional). And that pretty much makes it the biggest nominal tax increase in our history. Predictably, reactions to the SCOTUS decision fell along conventional red/blue fault lines with the left cheering and the right jeering the decision. My view of the original health care reform debate was well documented on this blog. Despite recognition that the individual mandate violated my libertarianish political preferences, I supported the Wyden-Bennet Healthy Americans Act which included the mandate. My reasoning was straightforward - Americans wanted real reform of a broken health care insurance system at an affordable cost. The individual mandate was the only path I could see to get there. Wyden-Bennett would have provided universal coverage, protection against financial ruin if struck with an illness and fiscally responsible reform that contained costs and was tax neutral. I was willing to sacrifice some principle on the individual mandate for practical real reform. The impossible dream of rational health care reform died when Wyden-Bennett was thrown into the dustbin of history by administration support of The Great Obamination - aka the "Affordable Care Act" aka "ObamaCare". ObamaCare does not provide universal care, does not contain costs, is not understandable by mere mortals, and imposes heavy new taxes. 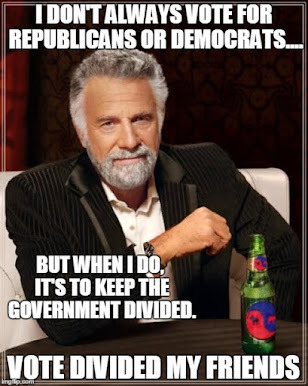 But thanks to a purely partisan Democratic vote in the Senate and the recent Supreme Court decision - it is here to stay. More interesting and receiving less coverage is the impact of ObamaCare on the generational divide. When candidate Obama announced his intention to run for president, I posted a tongue-in-cheek observation that a generational war on the Boomers was declared, a theme I returned to again and again. Then and now Obama enjoyed broad support from the "Millennials" with some crediting the younger generation for his election in 2008. "One of the primary ways that President Obama (born 1961) is making the so-called Affordable Care Act affordable is by having you foot more than your share of the bill. Think it through for a moment, especially given that younger voters seem to really dig him. The younger you are, the less likely you are to need health care, much less insurance (there is a difference). The smart move for most generally healthy younger people is to take out a catastrophic coverage plan that would cover you in the event of a big accident. Thanks to Obamacare, you've got to get covered, either by your parents' plan or otherwise. The predictable result is that plans for younger people are getting more expensive precisely at the moment they are required by law (finally, a case where correlation meets causation!). 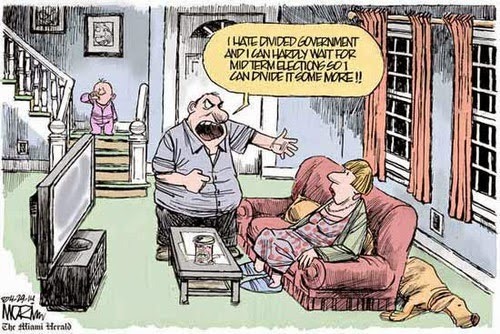 That all plans are going to have to conform to higher-than-before benefit schedules ain't helping things either. Some colleges are dropping student plans as a result. You're the mark here, the chump who's believing in Bernie Madoff even after the grift has been revealed. There's not going to be a bigger idiot to come along and keep the pyramid scheme alive. " Social Security and Medicare were created in a very different America as a response to very different circumstances. The old-age entitlements were designed to alleviate problems related to an economy still in transition from rural agriculture to urban manufacturing and post-industrial services. Private pensions and retirement savings were relative rarities, and the communitarian dream of multiple generations living under the same roof—invoked as an ideal by some of the very people, such as Joe Biden and Hillary Clinton, who champion old-age entitlements as a means of “independence” for seniors—was a routine necessity. That’s no longer the case in a country where most retirees are wealthier than the younger people paying for their benefits. According to 2010 data (the latest available) from the Bureau of Labor Statistic’s Consumer Expenditure Data, the typical American 65 or older had a pretax income of about $41,000 and annual expenses of about $37,000, including $4,800 for all medical care costs they bear under the current regime (insurance, prescription drugs, doctor’s visits, etc.)." This is not just about ObamaCare. ObamaCare is but one facet of the real issue. The real issue is O-Boomer-care. 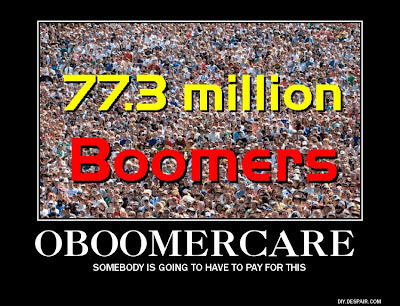 The real issue is the huge cumulative burden of paying for the Boomer's Social Security, Medicare, and Obamacare entitlement benefits. It is a heavy back breaking financial load that will be carried by the Millennials over their entire working life. Obamacare just made the pre-existing problem a lot worse. The numbers simply don't add up. This really is a generational Ponzi scheme and, like all Ponzi schemes, will work only as long as enough new suckers can be found to "invest" so that older "investors" can cash out. The Greatest Generation kicked off the con with Social Security and added Medicare, but they understood the game. 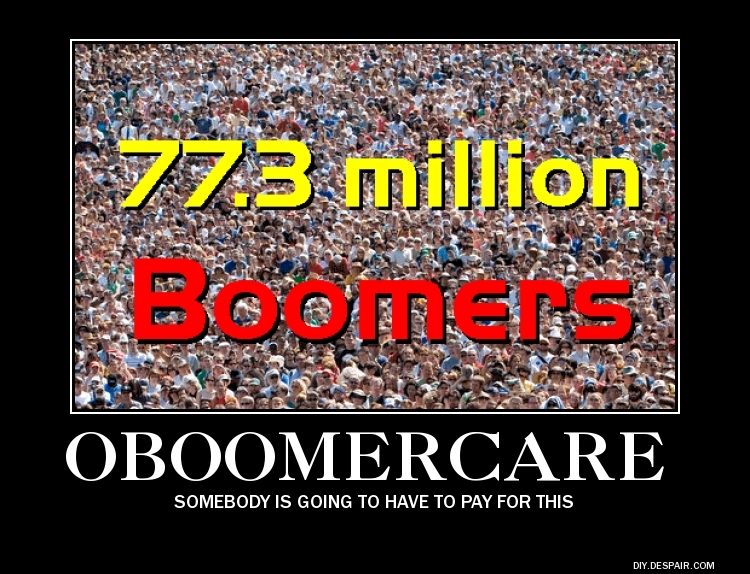 They made a lot of babies - the Boomers - so it is/was relatively easy for us to pay off their benefits. We Boomers expanded Medicare and added prescription benefits, but we've barely made enough babies to pay for it. Still, thanks to the Millies, it looks like we may squeak through and get most of our payoff (well, at least us early Boomers). The Millies can take credit for piling on the additional ObamaCare benefits, as they are the ones that elected him. But they are just not making enough babies to have any hope of securing their entitlements from the next generation. The cold hard fact is that we Boomers will be extracting the remaining potential winnings from their paychecks for as long as they are working. I think this generation needs a new name. I submit for your consideration - The Dumbest Generation. Like P.T. Barnum almost said... "There's a Millennial born every minute, and two Boomers to take 'em."